Being a part of the livestock judging team opened doors for me that I didn’t even know were closed. Getting to travel the country to compete at national contests provided an outlet for my competitive nature, but livestock judging never felt like a “cut-throat” environment. Yes, everyone competed to win, but there is an undeniable spirit of camaraderie within the livestock judging community. The relationships I have formed with fellow collegiate judgers will be life-long friendships and if not for livestock judging, I would never have met many of them. The livestock breeders, coaches, and other people connected to collegiate livestock judging that I had the pleasure of meeting are now valuable connections who have respect for the commitment livestock judging requires and the skills it teaches. 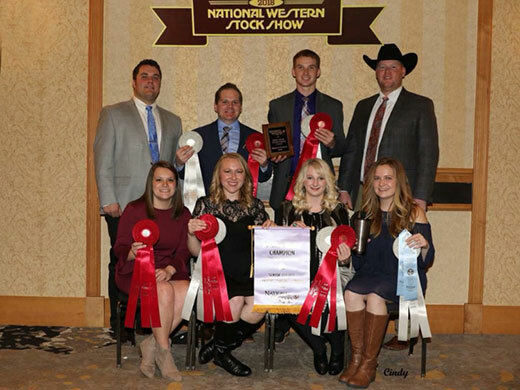 During my time on the livestock judging team, I not only strengthened my ability to evaluate livestock, but I also gained invaluable time-management, public speaking, decision making, stress management, and communication skills. These competencies will prove beneficial throughout my professional career. And while I feel that livestock judging is truly unparalleled in the development it provides to young people and cannot understate the impact it had on my life, livestock judging does not have a monopoly on the development of real-world skills. Despite my unwavering support of the experience that gave me so much, I am not writing to recruit for the livestock judging team (although who am I kidding, go ahead and join.) However, I do want to encourage anyone reading to go find YOUR “livestock judging team” whatever organization, club, or team that may be for YOU. There is not going to be another time in your life when opportunities are so readily available. My collegiate livestock judging career was the most meaningful experience of my life and has prepared me for success, so to the college of ACES, and all who made such an experience possible, thank you.